‘Game of Thrones’: Which Characters Have Valyrian Steel? Which Characters on Game of Thrones Have Valyrian Steel? Brienne with Oathkeeper, Bran with the dagger, and Jon with Longclaw. Say, have you seen any Valyrian steel lying around? Why am I asking? Oh, no reason, just there’s a giant army of the dead about to invade Westeros and they’re commanded by these evil demons who are only vulnerable to Valyrian steel and dragonglass. I guess you could say it’s a pressing issue. 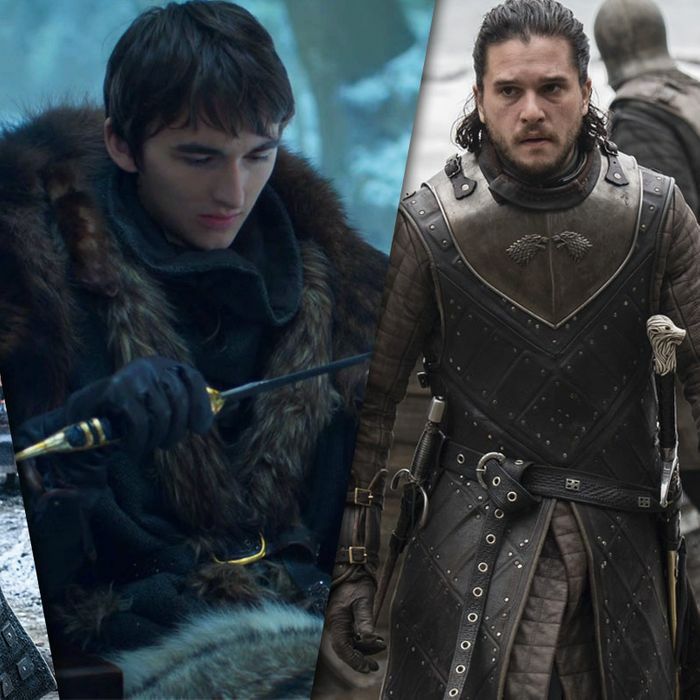 Anyway, in the interest of everyone in Westeros not dying, here’s a helpful roundup of all the Valyrian steel weapons we’ve seen in Game of Thrones and who’s got them right now. Oathkeeper was originally a gift from Tywin to Jaime Lannister, but he regifted it to Brienne of Tarth when he sent her on a mission to find the Stark girls. (She’s the one who named it.) Brienne tried to give it back to Jaime at Riverrun in season six, but he let her keep it. Fun fact: The end of Brienne’s duel with Arya is the first time we’ve seen two Valyrian-steel blades go up against each other on the show. The second of the Lannisters’ new Valyrian-steel swords, this one was a wedding gift to Joffrey, who gave it its garish name. After Joffrey’s death, Jaime decided, “Hey, might as well take it, it’s not like anyone else is using it,” and so now he’s got it with him in the Reach. This one started as the ancestral sword of House Mormont, so Jeor Mormont passed it down to Jorah when he joined the Night’s Watch. When Jorah fled Westeros, he left Longclaw behind in shame, and so it got sent back to Jeor. (Lyanna Mormont was a little too young to wield it, I guess.) Jeor then gave it away a second time, to his substitute son Jon Snow as a way of thanking Jon for saving him from a wight attack. Jon has carried it ever since. If you’re wondering why the pommel of the sword is the wolf of House Stark instead of the bear of House Mormont, it’s because Jeor got it replaced before he gave it to Jon. What a guy! Now that’s a metal name. This is the sword of House Tarly, and yes, they have a Valyrian-steel sword and the Tyrells don’t, which I’m sure caused a lot of tension before the Tyrells stumbled into bigger problems. Randyll Tarly kept the sword hanging on his mantle before Sam stole it away in the night. It’s now with Sam at the Citadel, though curiously Randyll doesn’t seem to have made even the slightest effort to get it back. After appearing way back in season one, this dagger popped up in “The Spoils of War,” when Littlefinger gave it to Bran for some reason. A refresher: When Bran was in a coma, an assassin tried to kill him with the dagger. Catelyn fought him off and took it to King’s Landing, where Littlefinger told her it belonged to Tyrion. (It didn’t; he was lying.) We still don’t know who gave the assassin the dagger, but now that it’s in Arya’s hands, we can be pretty sure she’ll end up using it.